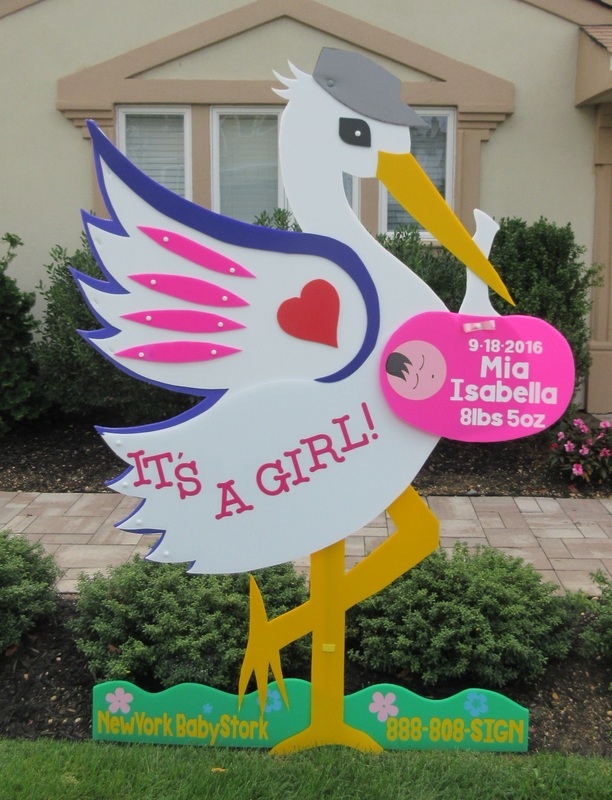 New York Baby Stork and Long Island Stork Signs has baby girl stork sign rentals and baby girl birth announcements delivered to Suffolk County and Nassau County Long Island, seven days a week and within 24 hours of your order - and there is never a delivery charge! and You Want to Tell the World! Our new baby lawn storks are over 6ft tall and get plenty of attention. They include our exclusive little baby bundle plaque - a new baby girl wrapped in a blanket that is personalized with your babies name and birthweight. Let's celebrate with a New Baby Girl Stork Sign! Got a New Baby Girl? Rent a Baby Girl Lawn Stork anywhere on Long Island!